I decided to spend last week actively searching for artisitic photo opportunities. Artistic photo opportunities such as architectural details, clouds, black & white street scenes etc. etc. That didn't quite work out. The entire week I seemed to be stalked by extremely absurd subject matter. Case in point. 100 yards from where I work was an old Latvian man selling his hand made birdhouses. 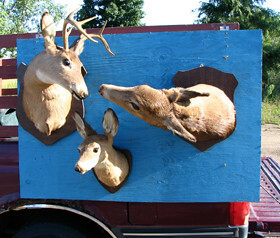 To attract attention he attached this kissing deer installation to his pick-up truck. The corner on which he was selling his creations is always empty. I've been working in the same location for 6+ years and he's the first person I've ever seen trying to sell his wares there. 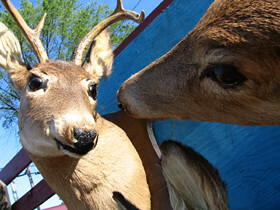 At that point I gave up trying to get "respectable" artistic photos and instead decided to embrace the oddities. Stay tuned for more oddities. Hilarious as that Latvian man can be pictured with his pick-up and birdhouses.